2016 Fall Outfit Ideas If You Think Have Nothing To Wear – Team with neutrals and simple lines, or think of all the other ways in which you could use them! This staple is amenable to whatever takes your fancy; match or mismatch, it’s up to you. Layering is one of the best, easiest and most stylish things you can do if you want to look fab and feel comfy during cold days. You can go for that really cute and chunky oversized sweater as your top layer as long as you wear something like leggings or skinny jeans so that your physique looks proportional. This fall, wear layering accessories like leg warmers, scarves and tights for extra style and extra comfort. 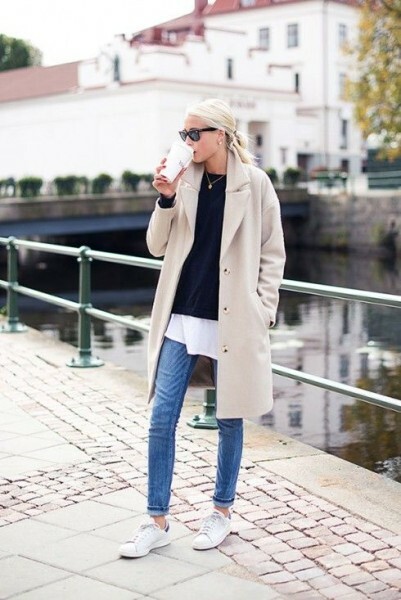 Brown camel coat, striped jersey, pale blue scarf and skinny jeans. Bet this is Paris. We think this autumn style staple is so practical, that you’ll still be rocking it next spring!